Sat., Oct. 14, 2017, 11:47 p.m. 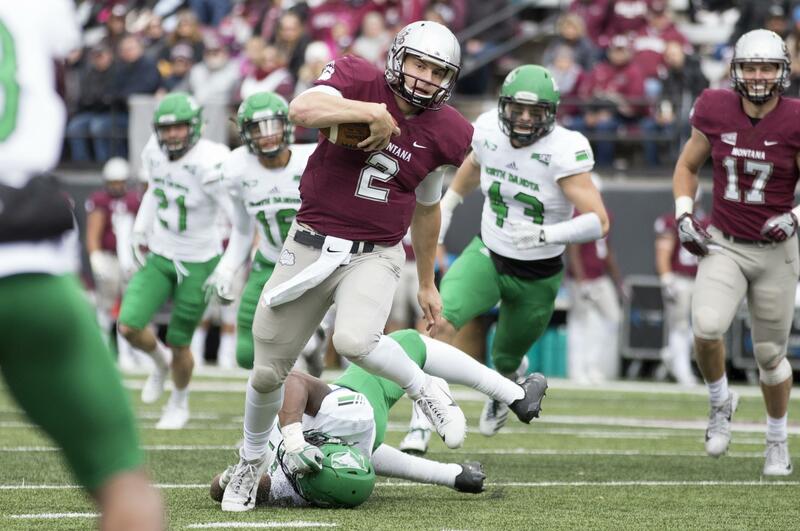 The battle of green quarterbacks went to freshman Gresch Jensen Saturday, after he threw for a career-best 423 yards to lead Montana past banged-up North Dakota 41-17 in Big Sky Conference football in Missoula. Making his fourth start, Jensen threw for three touchdowns and ran for another score as the Grizzlies moved to 5-2, including a 3-1 mark in the Big Sky. His first start came on Sept. 23, a 48-41 loss to Eastern Washington. The Grizzlies withstood three first-quarter turnovers by Jensen and pushed to a 20-3 halftime lead over the Fighting Hawks (2-5, 1-3), the defending Big Sky champions. Jensen threw an interception on a deep pass on his first snap, then fumbled at his own 32 on Montana’s third possession. He added another interception on a fourth-down play in North Dakota territory. Northern Arizona 42, Portland State 20: Case Cookus passed for 347 yards and four touchdowns and Cory Young rushed for 109 yards and a score on 13 carries to guide the Lumberbacks (4-2, 3-0 Big Sky) over the Vikings (0-6, 0-4) in Portland. The Lumberjacks are 9-3 all-time at Portland. Cookus topped 6,000 career passing yards in the win and moved into seventh place on NAU’s all-time list. His 6,221 yards leaves him 73 yards shy of sixth place. The Lumberjacks have posted four straight games of 400-plus yards on offense and five of six games overall. The Vikings hung tough in the first half and, after Za’Quan Summers’ 65-yard TD run and two Graycen Kennedy field goals, trailed 14-13. But NAU scored 28 straight points in the second half to pull away. Cookus had scoring strikes to four different receivers. Summers finished with 104 yards on 10 carries for PSU, while Josh Kraght added 94 yards rushing and 152 more passing with two interceptions. Southern Utah 32, Weber State 16: Patrick Tyler was 20-of-30 passing for 281 yards and threw two of his three touchdown passes to Logan Parker to help the Thunderbirds (4-2, 2-1 Big Sky) defeat the Wildcats (4-2, 2-1) at Ogden, Utah. Published: Oct. 14, 2017, 11:47 p.m.